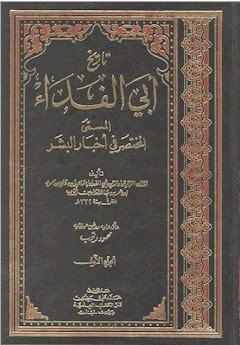 Abu al-Fida (Arabic: أبو الفداء‎; or Abul-Fida' al-Ḥamawi or Abul Fida Ismail Hamvi, fully Abu Al-fida' Isma'il Ibn 'ali ibn Mahmud Al-malik Al-mu'ayyad 'imad Ad-din; also transliterated Abulfeda, Abu Alfida, etc. ; November 1273 – October 27, 1331), was a Kurdishhistorian, geographer, and local governor of Hamāh. He was a prince of the Ayyubid dynasty and the author of The memoirs of a Syrian prince: Abu'l-Fidāʼ, Sultan of Ḥamāh. The crater Abulfeda on the Moon, is named after him. Abu Bakr sent Umar to Ali and his companions to bring them out from the house of Fatima and he (Abu Bakr) said: If they resist, confront them. Umar came with some fire to burn the house. Fatima saw him and asked: O son of Khattab, where are you hastening to in this way? Have you come to burn down my house? Umar said: Yes, except if you do that which people have done.